Making space for Taking Initiative In and Through Relationships has several layers. In order to pursue the Reflective Practitioner Goals you have to take initiative. In particular, you have to take initiative in relationships, such as those with your advisors and peers. At the same time, it is through the relationships you develop as you pursue these goals—including your relationship with yourself—that you find support for the risk-taking and change that is involved in taking initiative in relationships. Yet, not all the reflective practitioner goals pull you in the same direction; or, at least, it is difficult to attend to them all simultaneously. You might focus on a few at any given time, but the challenge is to keep the other considerations in mind and address any tensions among them. All these layers, but especially the last challenge, are what it means to make space for taking initiative in and through relationships. 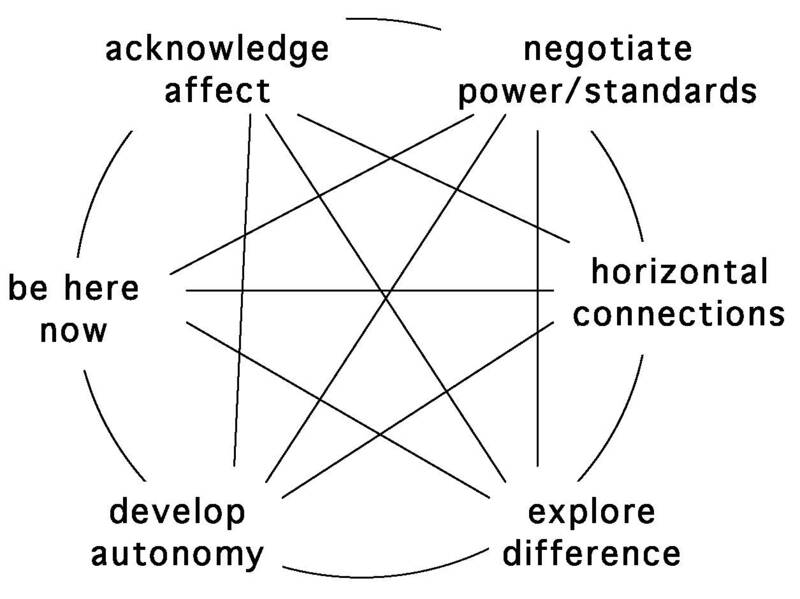 Negotiating power and standards (a “vertical” relationship). Building peer or “horizontal” relationships. Exploring differences and diversity among people. Acknowledging that affect (i.e., emotion) is involved in what you are doing and not doing (and in how others respond to that). Developing autonomy (so that you are neither too sensitive nor impervious to feedback). Do not expect to learn or change without moving among or being jostled by the interplay or tensions between these different considerations. For example, to “be here now” might involve shaping relationships so that others can and want to help you by taking over responsibility of things that have been distracting you.